FYI: Long overdue review here. I had the pleasure of stumbling upon a Simple Squares bar over a year ago. And it could not have filled a void more perfectly. Being someone who has a host of food allergies and intolerances, it can be super difficult to find quick fix snacks, and options to throw in my purse, backpack, for travel, etc. Keeping my blood sugar balanced is also a constant battle for me, so having something in my bag, like Simple Square Organic Nutrition Bars is a lifesaving thing. More recently I located the fine folks from Simple Squares at Natural Products Expo East in Baltimore, and was thrilled to see that in addition to the one flavor I had already tried, which was Coconut, they also offered a variety of other very appealing flavors (including a few that I had to recruit my team of non-allergic test humans to try *for* me). Simple Squares are organic, certified Paleo, Non GMO, and also gluten, dairy, corn, and soy free. They include only 5 simple ingredients ; whole food, simple ingredients. Each bar has what I would describe as a pleasingly subtle sweet yet savory flavor. I feel like the hints of flavors are subtle enough that they should be appealing to most palates. Being a spicy spice fan, if I had to pick my favorite, I would be torn between the Cinna-Clove and the Ginger. However, my test tasters have concluded their favorites are the Coffee and the Cho-Coco. I really would be perfectly content with any of the varieties of Simple Squares, just as long as they maintain their wonderful simplicity that makes them the perfect snack, meal replacement, or sidekick to your morning coffee or tea. I feel that a sampler of Simple Squares should be a staple in every household. I know having at least one Simple Squares bar on my person at all times is essential. Try them all out. They even offer a sampler, which I highly suggest purchasing. An entire month has somehow rolled by, since the inspiring but exhausting adventure of Natural Products Expo East in Baltimore. I had, and still have SO many items on my list to check off, people to reach out to, and basic follow up that still remains. However, on the list of my things to do, fighting off another “flare” of inflammation was not one I had allotted time for. I started having issues way before we left for Expo East. But overall, it *seemed* like I had a handle on things. I mean, I was not denying the symptoms. I had opted to remove grains completely once again (vs allowing myself to test them out about once per month). And I was also attempting the mind over matter state of refusing to let this nonsense slow me down, ruin my fun, or derail my plans. But here I sit a month after Expo, and a few months after any initial signs of flares started back up again – INFLAMED. Yet again. I am uncomfortable ALL of the time. I can no longer fit into any of the clothing I had been wearing for the past few years (unless it is extremely stretchy, &/or was already a few sizes too big to start with). Thank goodness for the hand me down “too big” items that I had held onto, with the idea that I would use my sewing machine to alter them to fit. And apparently I should be thankful for my procrastination and lack of time to actually ever get around to altering them as well. Because now I at least have a few things I can throw on. Because due to ridiculous medical debt (all uncovered services that my insurance does not deem as medically necessary), I most definitely do not have the $$ to buy new clothes. Oh & shoes. The foot thing again. I thought I had seen the end of that back when I removed gluten from my life completely. But the day before Expo, I was forced to spend money I did not have on a good pair of comfortable shoes in a BIGGER size. Because you know, my entire lower body has again swollen to the point that nothing fits, including my shoes AND even some of my socks. I lived this annoying nightmare before, prior to realizing I was reacting to gluten and dairy. And I really was confident that I would never have to deal with this again. But here it is. So body – you miraculous but complex vessel – WTF is the deal THIS time? Tell me please. I am totally listening. And I am up for the challenge of whatever needs to be done. But come on! This is getting ridiculous. I spend so much energy, time, and have truly exhausted myself just LIVING each day. So cut me a break here. Why in the world are you swelling up, and hurting like I’ve been run over by a truck every single day? WHY? I suppose this post is more about venting. I have been needing assistance to get out of bed nearly every day, and I feel bruised and battered over my entire body. Even my eyelids have started hurting. I know this feeling because it was my daily life a few years ago. But I figured it out. And I put it behind me. So what now? I think way too much. I can’t do anything but think, and research, and troubleshoot. I want answers, solutions, and relief. I have been practicing as much patience as possible. I have a daily yoga practice, which sadly has switched from enjoying practices at a few favorite studios around town to mostly a home practice, simply because I fall, and moan in pain so much now, that I prefer to practice in private for the time being. If I did not have these things, I am certain I would not be able to get as much accomplished as I do. So I am grateful for this. But with all of the pondering, the main thing that keeps coming back to me is how incredibly reactive I have become overall. And I think it might have something to do with a house that we recently moved out of. I refer to it as the “Mold House”. There was something horribly wrong with the house, and we were there for 9 months. I am suspecting that just by living in this toxic space for so long, it somehow triggered more responses in my body, & ultimately weakened my system so that I now react to nearly everything, and in a more severe way. I will say that I am doing much better than when we were IN the house. Because while we were IN the house, i was breaking out in hives for no apparent reason at least 5 days per month. And I could not even open jars, carry out the trash, or breathe through the night. But I fear the damage was done. And I simply do not know at this stage what I can do. My answer for getting through Expo East was simple. I just added to my already growing medical debt by getting a few infusions. I got one of my favorite Vitamin/Mineral infusions, as well as a Glutathione infusion for detox. I feel like if I could afford to get those regularly, I would be well on my way to some type of progress. Enough of my rambling. It just felt like time to share something, since I had been neglectful and very delayed in my reports of Expo East. I have a lot to share. But so little energy and brain capacity these days to do so. So bear with me. I welcome all suggestions, resources, etc when it comes to digging myself out of these holes. The medical debt AND the chronic state of inflammation that I currently find myself in. I will find a way to be more uplifting with my next post. Yoga will save the day for me though. It always does. Namaste. What a lovely, busy weekend I had during the Gluten & Allergen Free Wellness Event when it stopped near Kansas City, at the KU Edwardsville Best Conference Center in Overland Park, KS. Thanks to the hard work from all of those involved. I was amazed by the boundless energy possessed by those wonderful ladies in charge. I can’t summarize things much better than my GFF Kathleen from Soul Food Heals did. She is likely much more thorough than I could be. I am so fortunate that I had the opportunity to spend some extra time with her during her stay in Kansas City. I concur with everything she said, and I have a very special place in my heart for KC Natural BBQ Sauce. This local Kansas City company has recently released a nightshade-free sauce – their Mastodon Sauce – and it is out of this world. Folks at the GFAF Wellness Event in Kansas City had the opportunity to try that sauce, along with the Original and Sriracha-Q Sauces as samples. I highly suggest checking out what the Food Equality Initiative is up to as well. Great people, with an inspiring vision. I hope to see more of them in the near future. It is such a thrill to see something like this right here in the midwest. For those who are needing more dairy-free options, the Mean Vegan booth was a great stop. They had their unbelievably delicious “cheese-y” & saucy jackfruit tamales, that just happen to be vegan (but you would never know it).They also had some of their other products out to sample. My cohort was quite happy with the mushroom jerky (also vegan). My find for the event, that I had never tried, and was delighted to be able to enjoy were the allergen-free products from The Gluten & Grain Free Gourmet . O M G ! I was able to eat multiple things from this booth. And they were all insanely good. I think that my favorites were the Cashew Butter Chocolate Chip Cookies, the Paleo Coco No Bake Cookies, and the Paleo Almond Sea Salt Chocolate Bar. So good! And grain-free. This makes me so happy. Make sure to give some love to the organizations and companies involved with this event. Please check out their websites below. It is heartwarming to see the growth in people who want to support this community. I am so very grateful. And it happened again. I was exposed to nightshades. And not in an extreme way either. Typically this happens when I either neglect to ask for every single detail (including spices used) if eating food prepared by others. OR there are times when I have covered all of my bases. But somehow the ignorance about what nightshades are/aren’t ends up being the culprit. Meaning that if someone says they require a meal to be nightshade-free, this means NO nightshades in any form. Even if it was just a tsp of paprika or cayenne in the entire dish, this can and will still cause a reaction. Which to the person who is not familiar with the term, a tiny sprinkle of something likely seems so insignificant. But to the contrary, that little tiny bit triggers inflammation in my body; some of which can last for a few days after even just one bite of something that likely had just a speck of a powder spice form of a nightshade. As I sit here in pain from swollen and tender joints, with unattractive skin eruptions (that also hurt) covering my face, feeling angry that a mistake of taking one bite of something that I thought only had black pepper on it could do this much damage, I also have a contrasting feeling of hope and contentment. My happy place during this post nightshade exposure time is found courtesy of a local Kansas City company who makes gluten free, all natural, certified non-GMO BBQ Sauce. This company – KC Natural recently released a Feud With Food approved, nightshade free BBQ sauce called Mastodon Sauce. This is a huge deal for me since I have pretty much not consumed condiments at all since going gluten free. And once I realized that nightshades were an issue, the odds of finding anything in the condiment world that was safe were pretty unlikely. This sauce is not only safe for me to eat. But it’s pretty flipping delicious, too. I actually think I might have a problem with now wanting to put it on absolutely everything. I am in love with this new found option of deliciousness. It tastes great on Hilary’s Eat Well Veggie Burgers, as well as on Mean Vegan ChickUn. KC Natural will be at the Kansas City Gluten & Allergen Free Wellness Event on Sunday, September 27th, and I will be there singing their praises. For those who are not following an AIP (Autoimmune Protocol), or needing to be nightshade free, I still suggest trying not just the Mastodon Sauce. But please check out the other varieties as well. I would love to hear your feedback (since I sadly cannot taste the ones with tomatoes & peppers). I will be writing more about this sauce, KC Natural, the GFAF Wellness Event, AND other allergen free topics again soon. So stay tuned. 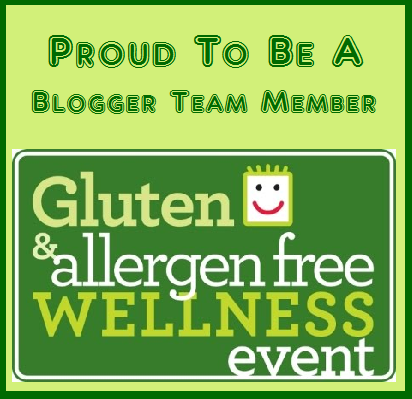 Stay tuned for FREE Tickets to the 2015 Gluten & Allergen Free Wellness event, as it stops in Kansas City. Well, actually the event itself will not be in Kansas City, MO proper. But instead in neighboring Overland Park, KS. Which is not too far from a few of my favorite places that offer gluten free options. Feud With Food will be giving away some tickets in the coming days. Be sure to like Feud With Food on Facebook, follow us on Twitter, Instagram, and Pinterest. And please spread the word about this great opportunity to learn, explore gluten free options, and build community. Find the details on the GFAF Wellness website. For those of you near Raleigh, NC the Gluten & Allergen Free Wellness Event is coming to you this Saturday, August 15th. Check out all of the information on their website. I am excited to be a part of this year’s series of events ; as Kansas City will be hosting the #GFAFEvent on September 27th. Stay tuned for more information, giveaways, and a full report from the event itself. I am thrilled to have this event coming to me. I normally travel for these things. But it will be nice to experience this locally for a change. It is finally the time of year where I start using more of my PTO from work to head some place on a plane, and feel more motivated to take road trips. So where shall we go this June? Minneapolis, where we will head to St. Paul to drink some gluten free beer at Burning Brothers Brewing, and then consult my Yelp bookmarks for the delicious gluten free food options that I visited during our last trip. Chicago is a must. Friends and food. It never disappoints. Omaha is still calling us to enjoy some vegan fare at Modern Love. And the beloved Northwest is again on the list. We were just there. But I have to go back. I have been craving Cultured Caveman since we returned home from Portland. And there are so many other places I still need to try. What are some of your favorite gluten free travel suggestions? Who wants to win tickets to the Vida Vegan Con Vegan Bazaar? Feud With Food has a pair of tickets to give away for the Vida Vegan Con Vegan Bazaar, Friday May 29th in Austin, Texas. *Follow Feud With Food on Twitter @feudwithfood, then find Feud With Food’s recent tweet about their favorite local vegan company from Kansas City who just launched their Kickstarter campaign. Retweet that tweet. *Like us on Facebook Feud With Food Facebook and share the recent post about the Kickstarter campaign launched by this same vegan company who uses jackfruit and mushrooms to create amazingly delicious plant based products, that just happen to be vegan.